THE Big Wet continues to bring traffic chaos to the southeast with flooding and landslips shutting more roads. The Gold Coast Springbrook Road at Springbrook has been closed between Pine Creek Road and Austinville Road due to a landslip, while heavy downpours have forced vehicles off the road on the Gold Coast. Police have warned of travel delays on the southeast's roads and advised motorists and heavy vehicles to avoid the M1 near Mudgeeraba due to the heavy rain. The area has been inundated with 135mm overnight. The Bureau of Meteorology says Brisbane, Ipswich, the Gold Coast and the Sunshine Coast may all be hit by a storm today. 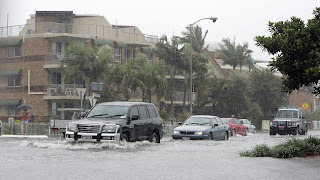 Brisbane residents woke up to a wet Sunday with heavy falls reported around the city. Bayside suburbs around Manly, where 66mm fell in 24 hours, are amongst the soggiest. We've seen the wet on tv. And you, still dry just like last year? We've got it all; snow, ice storms, rain....you know what i mean. Tonight we have to take a big drive to celebrate sinterklaas with my brother and parents near Apeldoorn. Will be fun, but no pleasure to drive. Yes we are still dry, we are up high on a hill slope. The pool is rapidly filling with all the rain though..
We stocked up on Kerst food at the dutch shop here in Brisbane, pepernoten, enz..